«return to news listAnd just like that, we’re getting to work on climate! In an exciting stroke of the pen, Governor Michelle Lujan Grisham announced this week that New Mexico will join the U.S. Climate Alliance, adding New Mexico to the growing list of states pledging to embrace the necessary and ambitious goals of the 2015 Paris Agreement. We were honored to stand near the governor as she specifically named methane capture as a focal point in the state’s effort to combat climate change and called out CAVU as a driving force in this process! The Governor’s actions this week demonstrate the crucial role that methane capture will play in the fight against climate change and the urgency with which we must act. The most recent report from the United Nation’s Intergovernmental Panel on Climate Change highlights the narrow twelve-year window we have to mitigate the worst effects of climate change. Because of its potency as a greenhouse gas, regulating methane emissions is one of the most promising ways to make dramatic short-term changes to the atmosphere that could be the difference between manageable climate impacts and disastrous ones. We are proud to have a governor that is taking such decisive action, and we are proud to be part of the diverse coalition keeping climate change in the forefront of the state’s legislative agenda. 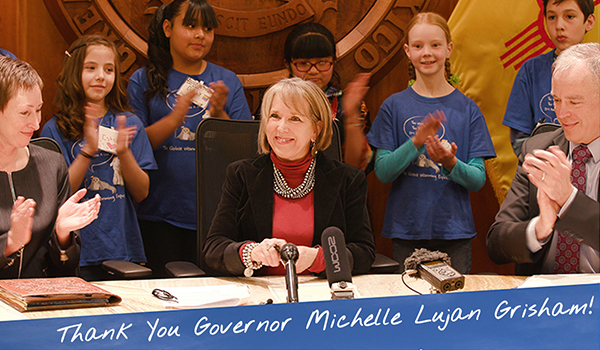 Thank you Governer Lujan Grisham for your leadership and thank YOU, friends of CAVU, for your support along the way. Support Michelle Lujan Grisham on methane capture and emissions reductions!